For the most part, we might see billboards as a visual nuisance, perhaps a necessary evil, and occasionally something useful, and they’ve been around for well over a century! Advertising professionals pay a lot of money to put their message, product, or service out in front of the thousands of people that pass by these billboards every day, but is that all they’re good for? Aside from advertising, or live billboards that might show current traffic alerts, can a billboard do something good for the community? Here are four billboards we found that actually give something back to the communities which they stand in. Lima, Perú, is the world’s second largest capital city located in a desert, home to some 8.5 million people. Many residents, in spite of living in a desert city that gets less than five centimeters of rain per year, have ready access to potable water. However, due to poor infrastructure and receding glaciers, hundreds of thousands must still rely on wells, many of which are polluted or are running dry, and therefore present a daily risk to those who drink from them. Interestingly, in spite of the fact that the majority of Lima’s fresh water supply has to be piped in from thousands of kilometers away, another ready source of water is already present. Because of Lima’s proximity to the ocean and warm temperatures, the local humidity often reaches 98 percent, depending on time of day, which means that the water is right there in the air, ready to be harvested. Of course, because the air is so warm, it never actually rains, so the water has to be drawn out somehow. A billboard, designed by the University of Engineering and Technology of Peru (UTEC) and installed by ad agency Mayo DraftFCB, is now producing thousands of liters of potable water each month for residents in the area. Refrigerating coils reduce the dew point of the air passing through the billboard, causing the water vapor to condense and change to its solid form. The water then passes through a reverse osmosis device to purify it, after which it is stored in tanks built inside the billboard’s structural columns. In the first three months of operation, nearly 10,000 liters of clean drinking water were extracted from the air, enough for hundreds of people’s daily water needs. It may be difficult to notice the direct impact your vehicle has on the atmosphere, but with the increasing amount of carbon dioxide (CO2) being created by transportation and industry, it has come to be acknowledged by the majority of society that climate change is certainly being driven by such emissions. What you may notice is the smog in some cities, generated by thousands of automobiles, which ruins the skyline and sends hundreds of people to the hospital every day. The next two billboards provide innovative ways for combating automobile emissions and climate change, to not only help you breathe easier, but help save our planet. A Coca-Cola billboard in The Philippines is “green” in more ways then one. The advertisement effectively uses the color green to outline the classic Coke-bottle silhouette, but what makes this billboard innovative is that the green color comes from thousands of Fukien Tea plants, each planted in a recycled plastic coke bottle and watered by an efficient drip-irrigation system. Each plant, as it grows, can absorb up to 13 pounds of CO2 per year. The entire 335 m2 installation is calculated to be able to absorb some 21.2 tonnes of CO2 from the atmosphere annually, the equivalent of removing about four 20-mpg cars from the road. 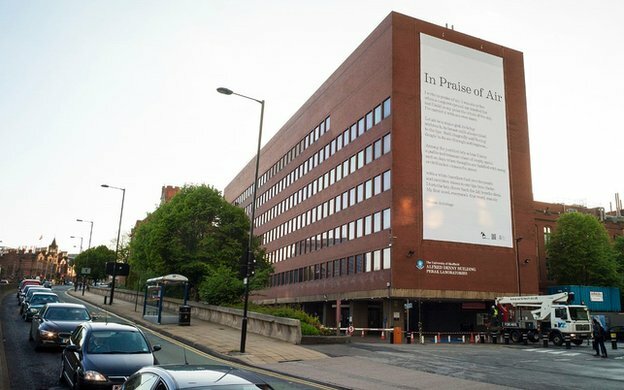 Another billboard, this one posted at the University of Sheffield in the U.K., features a poem, “In Praise of Air,” but that’s not all. Beyond the poem, the sign features something that can’t be seen or felt, even as it removes nitrogen oxides (NOx) from the atmosphere. A by-product of combustion in conventional vehicles, NOx reacts with sunlight, creating smog, acid rain, and even causing respiratory problems. The billboard, however, is treated with nanoparticles of titanium dioxide (TiO2). In combination with sunlight, TiO2 catalyzes NOx, turning it into harmless nitrate ions (NO3-). Scientists say the 2,150 ft2 (200 m2) sign can eliminate the equivalent of 20 cars’ NOx per day and, if it were allowed to flap in the wind like a flag, it could eliminate up to 100 cars’ NOx per day. Not every locale has convenient access to electricity, such as some of the poorest townships in South Africa. The financial corporation Nedbank has a billboard located on land owned by a school, which helps feed some 1,100 hungry kids every day, as well as provide needed power for their classrooms. Given that the area has plenty of sunlight and open space, which is needed for good billboard advertising, Nedbank figured it would be a great way to advertise and give back to the community at the same time. To that end, Nedbank mounted a bank of photovoltaic solar panels on top of its billboard. The generated electricity is clean, free, more reliable, and 100-percent cheaper than what is available on the grid, so the school can focus its finances on education and meals. Another of Nedbank’s billboards helping to support the community, is also fitted with a small wind turbine, generating clean electricity from the wind, as well as from the sun. These few examples show that billboards don’t have to be an eyesore. Perhaps, the next time you pass by one, take a closer look. It might just be more than meets the eye.